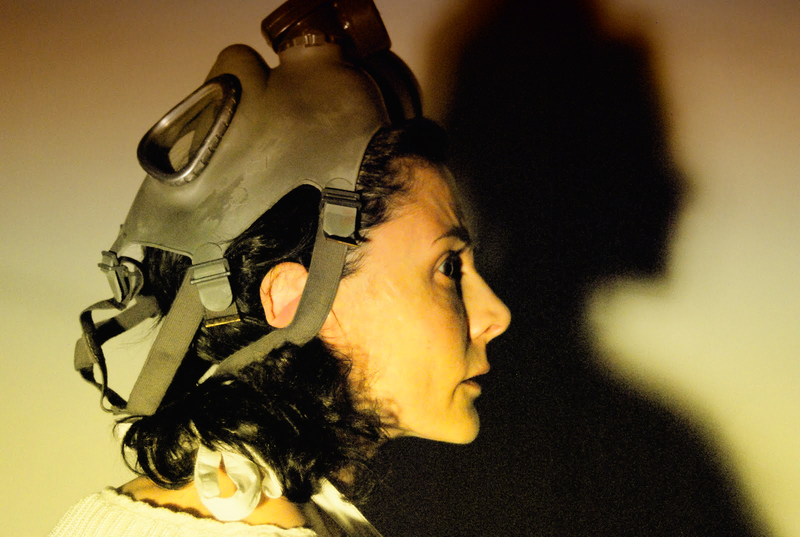 (Boston) The Man in the Couchis a hard candy nugget of science fiction and horror. On the surface it is smooth and hard and the characters’ inner depths continue to be the same. It isn’t sweet but it can offer some satisfaction. Our main characters are the rock and hard place that they have to breach in order to regain relative sanity/peace. It is reminiscent of The Twilight Zoneepisode “Nothing in the Dark” about an old woman shut away in an apartment to avoid meeting “Mr. Death” (the swoon-inducing Robert Redford). Gigi hasn’t left her house in years, doesn’t own a TV and refuses to allow others inside (physically or emotionally). It is her birthday and she hopes for a call from her son Alex. Alex, like Godot, never comes. In a freak Secret Ops. transmission accident, the Soldier is fused to her couch. He cannot move and is reliant upon Gigi for help. What ensues is a battle of wills: is the Soldier’s training capable of breaking Gigi’s routine? Lorna Nogueira as Gigi perfectly captures the anxiety of a woman suffering with agoraphobia so crippling that she has become a shut-in. She maintains an eerie calm when discussing her addiction to ritual. She gives an innate respect to Gigi’s mental condition – something that the ill deserve but don’t always get on the stage. At first glance, Gigi could appear “normal” to someone unacquainted with her anxiety issues. Nogueira has infused Gigi’s behavior with an anxiety trapped in her mind rather than in her physicality. In a stark contrast, Andrew Cromartie as the Soldier physically vibrates with similar anxiety. Wouldn’t you? He’s trapped in a couch for Heaven’s sake! Considering the circumstances, Soldier takes it well, considering that he’s fused into a velveteen couch from the 1970’s. His military training never prepared him for this. Cromartie presents the Soldier as the sweet boy-next-door; he doesn’t see his current situation as an excuse to be rude even though Gigi is mostly unresponsive to his pleas for help. One can’t tell if the Soldier’s kindness is a personality trait or if his training has kicked in. Science fiction is fun! Writer and director Alison Meirowitz/McCarthy has brought to the stage a fairly realistic portrayal of what happens when mental health and military operations collide. These events are real but in a few years they could be. The emotional challenges hurdled in the script are very real. Meirowitz/McCarthy’s writing offers a rare compassion to the anxiety inflicted. Gigi didn’t choose her prison in the same way that the Soldier didn’t choose his. Lastly, Science Fiction is not widely represented in the Boston-area. Thank you to Science Fiction Theater Company for diversifying our theatre community! This entry was posted in Uncategorized and tagged 2012, Alison Meirowitz/McCarthy, Andrew Cromartie, “Nothing in the Dark”, Boston, Godot, Horror, Lorna Nogueira, MA, November, Robert Redford, Science Fiction, Science Fiction Theater Company, The Factory Theater, The Twighlight Zone by Kitty Drexel. Bookmark the permalink.